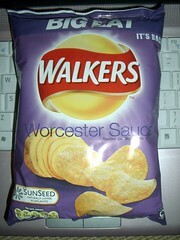 according an an American friend, a few Brits I’ve asked and Gary Lineker the crisps here are impressive. I lost half a stone while living in the US and my shoe-size mysteriously dropped from UK size 7 to 6. No more with the fat-feet! Can you guess why I lost this weight and how long before I revert to my pre-US, UK, sizes? This scribble was published on Sunday, February 10th, 2008. You can follow any banter on this scribble with the RSS 2.0 feed. You can leave a response, or trackback from your own site. What is your opinion of Pringles?